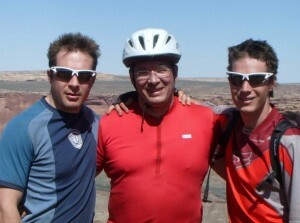 Lynn and two oldest sons at the end of a 110 mile mountain bike ride. WHAT IF WE HAD A SIMPLE HABIT that would grow our brain, lengthen our life, and help eliminate depression? Would you be interested? Maybe not, because few people are actually doing it. Only about one person in four. I am talking about exercise, of course. I am particularly interested in intense exercise, the kind that leaves your heart pounding and your lungs clamoring for more air. I am seeing more and more evidence for the widespread value of intense exercise. It helps you in so many ways. Here is a fascinating abstract from The Journal of Psychiatric Research. The effects of exercise on depression have been a source of contentious debate. Meta-analyses have demonstrated a range of effect sizes. Both inclusion criteria and heterogeneity may influence the effect sizes reported. The extent and influence of publication bias is also unknown. Randomized controlled trials (RCTs) were identified from a recent Cochrane review and searches of major electronic databases from 01/2013 to 08/2015. We included RCTs of exercise interventions in people with depression (including those with a diagnosis of major depressive disorder (MDD) or ratings on depressive symptoms), comparing exercise versus control conditions. A random effects meta-analysis calculating the standardized mean difference (SMD, 95% confidence interval; CI), meta-regressions, trim and fill and failsafe n analyses were conducted. Twenty-five RCTs were included comparing exercise versus control comparison groups, including 9 examining participants with MDD. Overall, exercise had a large and significant effect on depression (SMD adjusted for publication bias = 1.11 (95% CI 0.79-1.43)) with a failsafe number of 1057. Most adjusted analyses suggested publication bias led to an underestimated SMD. Larger effects were found for interventions in MDD, utilising aerobic exercise, at moderate and vigorous intensities, in a supervised and unsupervised format. In MDD, larger effects were found for moderate intensity, aerobic exercise, and interventions supervised by exercise professionals. Exercise has a large and significant antidepressant effect in people with depression (including MDD). Previous meta-analyses may have underestimated the benefits of exercise due to publication bias. Our data strongly support the claim that exercise is an evidence-based treatment for depression. What do you think of that last sentence? Exercise cures! Well, that may be too strong, but it is clear that we can achieve recovery, that is, a Beck / CES-D score of less than 10 by using vigorous exercise. I asked Dr. Schuch to comment on this post, as he is the lead researcher for the article. He points out that depression is generally a chronic condition, and as such, the “cure” of exercise needs to be ongoing. So let’s say this: Exercise is a dramatic help for treating depression.The effect size, what they here call the standardized mean difference (SMD), also known as Hedges G, is simply a measure of how far the distribution has moved. The reported SMD in this meta-analysis is 1.11. That is huge. That means that the whole group has moved 1.11 standard deviations toward the healthy side. Most psychotherapy SMDs run about .7 to around 1. That is very good. If you wonder what the SMD of antidepressant drugs is, it runs about .2 to .4. There is no drug trial I am aware of that shows an effect size, or SMD of .5 or greater. Kirsch and others point out that the placebo response is very large with antidepressants, so people receiving those drugs have a difficult time knowing whether it is the drug or the placebo effect making them feel better. Now we see from this comparison that exercise is a remarkably effective intervention with depression. So rigorous exercise is much better than taking an antidepressant. You can also use it to enhance medication. Why weren’t you told this a long time ago? The authors of the current meta-analysis argue that it is publication bias. That means that the authors and editors of journals don’t want it to be true. For example, Cooney et al. 2013 Cochrane review of exercise and depression was not encouraging. They argued that exercise wasn’t any better than medication. I thought it an odd way to state something. Why not say that exercise is every bit as good as medication, cheaper, and without the potential side effects? Frankly, it bothered me that the Cooney et al. report was so dismissive, when I had seen some individual studies that were much more supportive. Why does exercise help so much? Here’s my opinion: Because it stimulates BDNF, brain-derived neurotropic factor. Break it down. The brain makes a factor, like a hormone, that makes the brain itself grow. Exercise stimulates BDNF. As also, eating a vegetable-based diet, higher in fat, lower in protein, and very low in simple carbs. Sugar is a poison to your brain, and if you brain dies, your body will soon follow. Untreated depression shrinks the brain. The BDNF drops off. Particularly hard hit is the hippocampus, the memory center. Untreated severe depression is also a risk factor for Alzheimer’s. But when you exercise, or eat far more vegetables, or when you do things that make you feel socially connected, or when you are learning, all such lifestyle changes boost BDNF and grow the brain. Or, if you take antidepressants or get into psychotherapy or both, BDNF also goes up. We shrinks are preventing Alzheimer’s! How many of you therapists are promoting simple vigorous physical activity as a pathway to recovery? Probably not enough. One survey found about 20% of therapists were promoting exercise, in spite of research and experience supporting it. Lifestyle changes can promote physical and emotional health. The two are linked. Strong body, strong mind. We have formed a small group or researchers to develop a really important multicentric study including people from several places of the 5 continents. Interestingly, from that meeting, we found that we could great a small, but productive group (the six authors). We have been working in several projects and reviews. Maybe you can find many others papers that can be interesting, related to exercise and mental health. Please, find the links of the authors google scholar, in case you have interest.